Personal Evolution is a new series helping beginning and intermediate players develop fundamental skills. 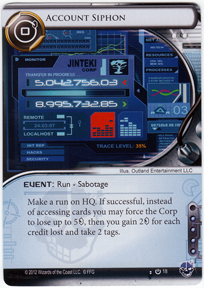 Today’s article provides a primer on leveraging flatline win conditions as corp. The release of Blue Sun has made Weyland relevant again, and sent players scrambling to sleeve up the Plascretes they thought they could do without. Timmy Wong’s third place performance at Worlds confirmed the power of the identity, coming in just behind Minh Tran in second place with a Cambridge-style Personal Evolution deck. Though these decks play very differently, they share one key similarity: both decks are able to win through flatline. In today’s article, we will discuss the threat of flatline, primarily in meat damage, and how to best leverage those types of alternate win conditions. For those who are unused to playing flatline decks, the first and least intuitive thing one must learn is that the point of running a potentially-lethal deck isn’t to kill the runner. The opportunity to kill the runner may present itself, and in the event that it does, you take your free win. However, the primary function of a flatline plan is to force the runner into inefficient play. For an easy example, a runner fearing damage must draw up before the end of their turn to stay out of lethal range. The runner’s plan may not require the cards they draw, and their turn would certainly be more efficient if they could spend those clicks any way they choose, but if they don’t draw up they may just forfeit the game. The same can be said for money, where the corp can apply additional pressure by racing the runner financially. In all cases, the threat of flatline dictates that, whatever the resource, enough to execute your gameplan alone may not be enough to survive. Now, this is not to say that a flatline plan can’t make a corp deck less efficient as well. 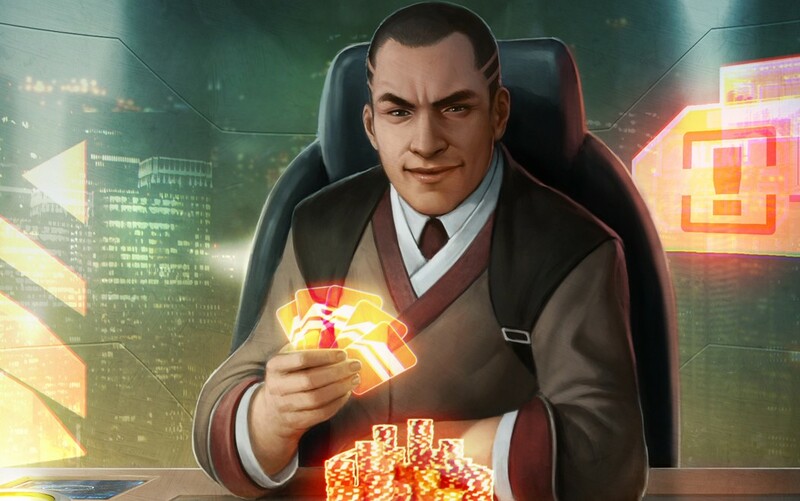 However, most of the inefficiency incurred by the corp occurs during deckbuilding, which means those inefficiencies can be mitigated by proper planning. Some deck construction choices you might make to facilitate your flatline could include devoting a large chunk of influence to a kill card, building an economy that can support a SEA Source, or putting together an agenda suite that facilitates Punitive Counterstrike (my favorite being seven 3-pointers and some Domestic Sleepers out of HB). But once you’ve made these choices, and optimized your deck around them, your hardest work is done. Meanwhile, the runner’s trouble is just beginning. Their deckbuilding commitment is less, but they may be forced to include hate cards. Further, they are forced to dig for and pay for those hate cards, or play awkwardly around the threat of death, while you may not even be able to execute your win condition. 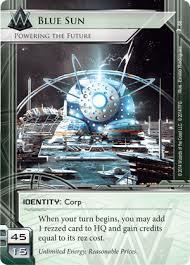 In circumstances where neither side has drawn into cards relevant to the flatline, the onus is on the Runner to dig while the Corp can proceed as normal. Are you sure you want that three-pointer? While your flatline plan doesn’t require you to do anything different to benefit from it, it does enable you to make plays which present the runner with a fork. While players new to flatline decks may overvalue the element of surprise in hopes of catching a runner unaware, more experienced players will recognize the threat of activation that a known flatline plan provides. The archetypal example is a Supermodernism player with a couple of Project Atlas counters. If the runner has seen at least one piece of SEA/Scorch combo in the corp’s hand, they are unable to run without a pile of credits much larger than accessing would normally require. The corp can leverage this information and this inflated credit requirement to create a scoring window, and land an agenda that further bolsters their economy and even further increases the runner’s cash on hand to avoid death. A more current example comes from a recent experience piloting Deadcoats. With the runner aware of but unable to remove the Punitive Counterstrikes from my hand, I was able to advance and score a 3-pointer in a new server with nothing but the threat of flatline to protect it. Net damage decks, namely Cambridge-style Personal Evolution decks, will fork using hidden information instead of public information. The archetypal example here is the use of Mushin No Shin. The card deployed could be a Ronin, which will kill the runner if left unchecked, or a Cerebral Overwriter which will enable a future Ronin kill if accessed. This fork punishes the runner both for opting to run and for opting not to, just as Supermodernism does by scoring out with a SEA-Scorch kill ready and waiting. As a runner, what do you do when presented with that sort of no-win situation? The key to surviving a fork created by a murderous corp is often finding a third option. In the previous example with Mushin No Shin, the runner can opt not to run the remote in a way that still insulates them from the risk posed by the Ronin. The runner can draw up to a full hand, such that Ronin, Neural EMP, Neural EMP won’t kill them. Once the runner can consistently demand a second Ronin, they can go hunting for it by digging through Centrals to remove the asset before it can threaten them. In other circumstances, it may be trickier, and there might not be a third way. In this case, risk assessment is the runner’s strongest tool. If the corp installs an agenda that would give them the win, but the economic disparity is vast enough that the runner can’t protect themselves from a Punitive Counterstrike or a SEA Source, the correct line may still be to steal that agenda. Stealing may put the runner at a high probability to lose, depending on how many of the combo pieces the corp has drawn, but allowing the corp to score it guarantees a loss. This play may not win you the game, and getting flatline could discourage you in that event, but it shouldn’t. In the long term, your overall win percentage will go up by taking the lesser evil, even if it’s only slightly lesser. 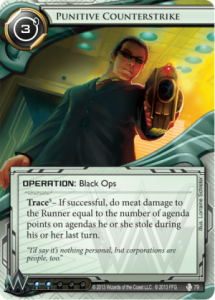 Finally, the runner can leverage hidden information to disrupt the corp’s math. A Punitive Counterstrike deck leveraging the threat of death to score an agenda that could be stolen has to take a calculated risk, and determine whether their economy will be in appropriate shape to retaliate in the event of a steal. The runner can capitalize on this by sandbagging economy cards. It’s not uncommon for a runner to play their Sure Gambles and Easy Marks as soon as they’re drawn, which means most corps will calculate their ability to kill you based on the credit total on the board (including economic resources and available clicks). A small swing in credits can punish the corp for taking this risk, to say nothing of the large swing in credits a card like Account Siphon can provide. I’m sorry, did I throw off your math? With these tactics in mind, you should be able to be the bully a corporation ought to be, and to shrug off the threats and intimidation when you’re at the runner side of the table. As the upcoming Order and Chaos gives Weyland new and exciting tools, I hope you’ll still look to their reliable, iconic tactic: death threats and explosions. Ben Conn was a Top 8 competitor in 2014’s Seattle and Portland regionals, piloting flatline decks for both. He can be found organizing for the Olympia, WA Netrunner scene. You can reach him at benyaminconn@gmail.com, or as @BenConn on the Stimhack forums. Blue Sun, Personal Evolution, Punitive Counterstrike, Scorched Earth, Weyland.